This pick-up, non-audition choir was founded in the summer of 2008 by director, Linda Taylor. 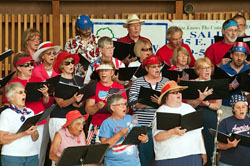 The first year brought out 30 singers for the July 4th outdoor concert at Riverside Park. By 2012 we had 55 singers. It is a short term commitment for three Monday night rehearsals before July 4th and a half hour performance as part of the Independence Day festivities. The chorus welcomes men, women, teens for a fast paced, quick learn, get-out-there-and-perform-even-though-you-don't-know-all-the-notes event. Who cares if it isn't perfect? We dress up in red, white and blue and have a blast singing familiar patriotic songs and selections about freedom, peace and love. Sign up next spring for a great time. We welcome shower-singers! !